It has been two years since Lehman Brothers filed for bankruptcy and the U.S. economy slid into its great recession. Are the structural problems that led to the financial crisis still present? How will the federal government’s regulatory reforms affect the financial sector? 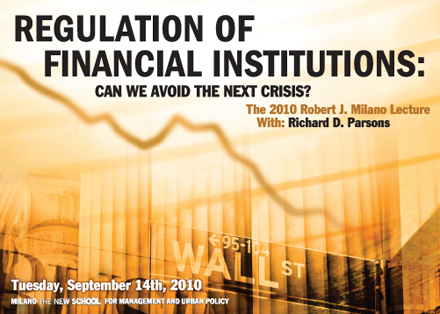 Citigroup chairman Richard D. Parsons addresses these question in the 2010 Card_Front, titled Regulation of Financial Institutions: Can We Avoid the Next Crisis?, The event takes place Tuesday, September 14, at 6:00 p.m., in the Theresa Lang Community and Student Center, Arnhold Hall, 55 West 13th Street (between Fifth and Sixth Avenues), 2nd floor. After the lecture, Parsons will join in a discussion with Adam Davidson, NPR’s international business and economics correspondent, and Jeff Madrick, senior fellow at the Schwartz Center for Economic Policy at The New School. Admission is free. Please RSVP at 212.229.5418 or centernyc@newschool.edu. This event is presented by Milano The New School for Management, the Graduate Program in International Affairs, and the Center for New York City Affairs. The Robert J. Milano Lecture and Scholarship are supported by the Milano Foundation. Additional support is provided by the Sirus Fund.